Klebsiella pneumoniae is an important opportunistic pathogen associated with nosocomial and community-acquired infections. A wide repertoire of virulence and antimicrobial resistance genes is present in K. pneumoniae genomes, which can constitute extra challenges in the treatment of infections caused by some strains. K. pneumoniae Kp13 is a multidrug-resistant strain responsible for causing a large nosocomial outbreak in a teaching hospital located in Southern Brazil. Kp13 produces K. pneumoniae carbapenemase (KPC-2) but is unrelated to isolates belonging to ST 258 and ST 11, the main clusters associated with the worldwide dissemination of KPC-producing K. pneumoniae. In this report, we perform a genomic comparison between Kp13 and each of the following three K. pneumoniae genomes: MGH 78578, NTUH-K2044 and 342. We have completely determined the genome of K. pneumoniae Kp13, which comprises one chromosome (5.3 Mbp) and six plasmids (0.43 Mbp). Several virulence and resistance determinants were identified in strain Kp13. Specifically, we detected genes coding for six beta-lactamases (SHV-12, OXA-9, TEM-1, CTX-M-2, SHV-110 and KPC-2), eight adhesin-related gene clusters, including regions coding for types 1 (fim) and 3 (mrk) fimbrial adhesins. The rmtG plasmidial 16S rRNA methyltransferase gene was also detected, as well as efflux pumps belonging to five different families. Mutations upstream the OmpK35 porin-encoding gene were evidenced, possibly affecting its expression. SNPs analysis relative to the compared strains revealed 141 mutations falling within CDSs related to drug resistance which could also influence the Kp13 lifestyle. Finally, the genetic apparatus for synthesis of the yersiniabactin siderophore was identified within a plasticity region. Chromosomal architectural analysis allowed for the detection of 13 regions of difference in Kp13 relative to the compared strains. Our results indicate that the plasticity occurring at many hierarchical levels (from whole genomic segments to individual nucleotide bases) may play a role on the lifestyle of K. pneumoniae Kp13 and underlie the importance of whole-genome sequencing to study bacterial pathogens. The general chromosomal structure was somewhat conserved among the compared bacteria, and recombination events with consequent gain/loss of genomic segments appears to be driving the evolution of these strains. Klebsiella pneumoniae is a non-motile, rod-shaped, Gram-negative bacterium belonging to the Enterobacteriaceae family. It occupies diverse ecological niches ranging from soil to water, but from an anthropocentric perspective it represents one of the most important human pathogens [1, 2]. K. pneumoniae are commonly reported as etiologic agents of either community-acquired urinary tract infections or bacterial pneumonia. However, it can cause any type of infection in hospital settings, including outbreaks in newborns and adults under intensive care, which is likely associated to its ability to spread rapidly in the hospital environment . A wide repertoire of virulence and resistance factors is present in K. pneumoniae genomes, allowing for the expression of capsule, siderophores, adhesins and antimicrobial resistance determinants [3, 4]. At present, six complete K. pneumoniae subsp. pneumoniae genomes are available on the public databases, namely K. pneumoniae strains MGH 78578 (multidrug-resistant [MDR] bacterium isolated from a patient with pneumonia ), NTUH-K2044 (a hypermucoviscosity (HV)-positive isolate obtained from a patient with liver abscess and meningitis ), 342 (N2-fixer plant endophyte still bearing pathogenic potential against mice ), HS11286 (MDR clinical isolate ), KCTC 2242 (a 2,3-butanediol producer ) and 1084 (an HV-negative clinical isolate causing liver abscess ). Other 115 on-going K. pneumoniae sequencing projects are available as scaffolds/contigs at the NCBI Genome database (http://www.ncbi.nlm.nih.gov/genome/genomes/815). The availability of closed genomes is important towards understanding the K. pneumoniae genome plasticity and the evolutionary forces that drive their genetic differentiation and occupation of distinct ecological niches. For instance, Wu et al. showed that the methionine salvage pathway, which might have a role in pathogenesis via oxidative stress, is present in all Klebsiella genomes but not in Escherichia, Salmonella or Shigella, thus providing diversity in virulence mechanisms in pathogenic enterobacteria. Moreover, from the comparative genomic analyses between strains 342 and MGH 78578, Fouts et al. identified variations in the distribution of genes related to surface attachment, regulation and signaling, secretion and transport, all of which may have important implications concerning their preferred lifestyle and host ranges (endophytic plant associations for 342 and human pathogen for MGH 78578). Among the antimicrobial resistance repertoire of K. pneumoniae, the production of carbapenemase is particularly worrisome since it confers resistance to all beta-lactams. KPC (Klebsiella pneumoniae carbapenemase) is the main Ambler’s class A carbapenemase found in this species, representing an emerging public health issue in many countries like USA, Greece, Israel, and Brazil . Interestingly, it has been shown that the worldwide dissemination of KPC-producing K.pneumoniae occurred due to the expansion of ancestrally-related isolates comprising the Clonal Complex 11 (CC11). Even though representatives of KPC producing CC11 have also successfully disseminated in Brazil, many KPC-2 producers reported in that country are not related to this epidemic lineage [10, 11]. In May 2009, K. pneumoniae isolate Kp13 (hereafter referred as Kp13) was obtained from the blood culture of a patient admitted to the intensive care unit (ICU) of a teaching hospital located in the city of Londrina, Southern Brazil. Kp13 was one of the representative strains of a clone that caused a nosocomial outbreak in that hospital that involved 18 ICU patients. It was the first time KPC producers were identified in that healthcare institution. Of notice, nearly 60% of cases died in average within 18 days after KPC-producing K. pneumoniae isolate was recovered. Although this outbreak was due to the clonal dissemination of KPC-producing isolates, Kp13 showed a distinguished antimicrobial susceptibility profile, expressively more resistant than the other isolates (Eliana C. Vespero, personal communication). In addition, it was previously reported that Kp13 possesses a unique capsular gene cluster, cpsKp13, among the approximately 80 capsular serotypes described to date . The genome of Kp13 was fully sequenced and showed to be constituted by one chromosome and six plasmids. To our best knowledge, it represents the first available complete and closed genome of a K. pneumoniae isolated from Latin America, as well as the first one of a K. pneumoniae responsible for causing a large nosocomial outbreak. In this report, we perform a genomic comparison between Kp13 and three K. pneumoniae genomes (MGH 78578, NTUH-K2044 and 342), to gain insights into the resistance and virulence repertoire of this strain, its unique/shared gene content relative to the compared strains and plasticity regions that may be circulating in other clinically relevant bacteria. MLST analysis classified Kp13 under the ST 442, sharing a single alelle with both ST 258 and ST 11, the main clusters associated with the worldwide dissemination of KPC-producing K. pneumoniae. Of notice, clinical isolates belonging to ST 442 have been only identified in Brazil so far [10, 11]. The complete genome of K. pneumoniae isolate Kp13 consists of 5,739,888 bp of which 5,307,003 bp form a single, circular chromosome (Figure 1) and 432,885 bp are split into six plasmids which range in size from 2,459 bp (pKP13a) to 294,493 bp (pKP13f) (Table 1). All the replicons were completely closed and the putative coding sequences (CDS) were manually validated. The reported sequence data can be obtained from the NCBI (http://www.ncbi.nlm.nih.gov/bioproject) under project accession ID PRJNA78291. 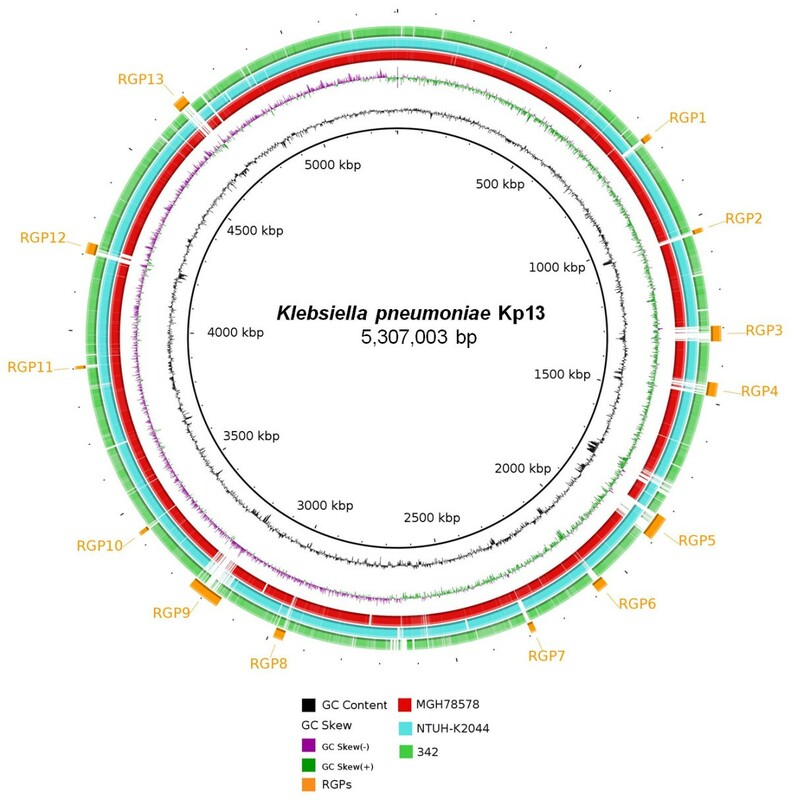 Circular map of the chromosome of K. pneumoniae Kp13 and related bacteria. The innermost ring represents the K. pneumoniae Kp13 chromosome used as reference and its coordinates. The second ring (in black) plots the G + C content of the reference, followed by its G + C skew (in purple/green). Red, cyan and green rings that follow depict BLASTN comparisons between the chromosomes of Kp13 and those of strains MGH 78578, NTUH-K2044 and 342, respectively. The outermost, interspaced rings (in orange) represent the localization of the predicted regions of genomic plasticity in the Kp13 chromosome, and the labels of each region follow the ones in Table 2. ‡Number of CDSs according to the submitted GenBank flatfile downloaded from NCBI for each studied genome. The G + C content of the Kp13 chromosome is 57.5%, which is in agreement with values previously reported for NTUH-K2044 (57.7%), MGH 78578 (57.5%) and 342 (57.3%) (Table 1). However, the plasmidial sequences present a much lower G + C content of 49.1 ± 4.4% (mean and standard deviation for the six replicons) suggesting the existence of DNA acquired during events of horizontal gene transfer (HGT), an observation that is corroborated by the number of mobile genetic elements (MGEs) such as transposons and phage sequences found in these plasmids. The number of transfer RNAs (tRNAs) identified in Kp13 was 86, which is identical to those of MGH 78578 and NTUH-K2044, but different than that reported in the strain 342 that carries 88 tRNAs genes (Table 1). Regarding the chromosome size, Kp13 lies between the human pathogens NTUH-K2044 and MGH 78578 , while K. pneumoniae 342 presents the largest chromosome size (Table 1). This is probably due to the accumulation of genes related to its adaptation to a different ecological niche since this strain is a N2-fixing bacterium . However, when considering only plasmidial sequences, the DNA content of Kp13 (432,885 bp, six plasmids) is markedly higher than other compared strains being followed by MGH 78578 (379,774 bp distributed among its five plasmids, Table 1). In fact, as it will be further discussed in this paper, a number of Kp13’s virulence- and resistance-related genes are plasmid-mediated and their respective proteins may contribute for evasion of host defenses and survival under antimicrobial selective pressure. The overall architecture of the chromosomes of K. pneumoniae Kp13, NTUH-K2044, MGH 78578 and 342 were studied using the Mauve tool , and these multiple alignments are shown in Additional file 1. This analysis evidenced an overall structural conservation and colinearity among the chromosomes of the different K. pneumoniae strains compared. The multiple alignments showed the existence of nine large locally colinear blocks (LCBs); however, it was observed that strain-specific regions were also present within LCBs (white segments in Additional file 1), which may harbor specific adaptations of each bacterium, as it will be further discussed in the plasticity segment section. These regions most likely represent DNA acquired during events of HGT and may provide a greater metabolic versatility to Kp13 strain . For instance, the chromosome of N2-fixing strain 342 was the one that most accumulated differences relative to other human pathogens (Additional file 1), such as the nif cluster located in a plasticity region unique to that strain (KPK_1696-KPK_1715) . Chromosomal inversions are thought to be one of the main events of genomic rearrangements in bacteria . Of notice, no recombination events leading to inversions of DNA segments occurred within the larger LCBs (Additional file 1). Only LCB2 and LCB4 (both smaller than 10 kbp) were found inverted relative to the Kp13 chromosome (Additional file 2). This observation reinforces the conserved chromosomal architecture among the compared K. pneumoniae strains since these strains are not epidemiologycally related and, in the case of 342, can be considered ecologically distinct from one another. A total of 13 RGPs were identified in Kp13’s chromosome when compared to the chromosomes of 342, MGH 78578 and NTUH-K2044 (Figure 1, Table 2). Most of these regions contain sequences related to transposable elements, and were flanked by genes coding for tRNAs or phage-structures (Table 2), which can be regarded as evidences for their horizontal acquisition . The amount of DNA located in these regions accounts for at least 400.1 kbp or 7.5% of the Kp13 chromosome. The main characteristics of these RGPs are next discussed, but additional information is provided as supporting information (see Additional file 3). *BLASTN performed against the ‘nr’ database at the NCBI website; dGC%, deviation from mean chromosomal GC content; s.b., synteny break from at least one other compared K. pneumoniae; phage, probable bacteriophage region; tRNA, presence of flanking transfer RNAs; transposases, presence of transposase-related sequences; T4SS/T6SS, presence of, respectively, types IV/VI secretion systems. RGP1 carries an insertion sequence at its 5′-end (IS1 family, KP05176) and harbors CDSs with predicted catalytic domains at the protein level including two possible dioxygenases (KP02716, KP02718) and a dehydrogenase (KP02715), which may be involved in the degradation of aromatic compounds , although further studies will be necessary to confirm this role. RGP2 contains genes for transposases and a possible phage integrase (KP16268) as well as hypothetical genes which do not allow for any inference on a possible metabolic role. RGP3 is 41 kbp in length and represents a phage insertion in the Kp13 chromosome, with the majority of its CDSs sharing greater identity to those of Salmonella phage SPN1S [GenBank:NC_016761]. A second, large bacteriophage-related RGP was detected in the Kp13 chromosome (RGP9, Table 2) and part of this region exhibits remarkable sequence similarity to that of K. oxytoca ϕKO2 prophage . Apart from phage sequences, a possible antibiotic resistance cluster that contains genes coding for transcriptional regulators (KP04065, KP04061), an antibiotic biosynthesis monooxygenase (KP04063) and a glyoxalase/bleomicin dioxygenase (KP04064) were found, but further experimental studies are warranted to establish the relevance of this region to the MDR phenotype displayed by Kp13. RGP4 is one of three plasticity segments containing genes responsible for type VI secretion system (T6SS) formation. T6SS proteins are part of a recently described apparatus that secretes toxins using a needle-like mechanism . They have been previously implicated in bacterial pathogenesis such as the HSI-I locus of Pseudomonas aeruginosa associated with persistent infections by this bacteria . A CDS coding for the VgrG protein was identified in RGP4 (KP01061). This protein may play both the role of an effector (influencing the target cell physiology) as well as of structural component of the T6SS where it has been reported to form part of the puncturing needle . Two other T6SS-related RGPs were detected in the Kp13 chromosome inside of the RGP6 and RGP8. RGP6 contains CDSs coding for bacteriocins, proteins that target other bacteria and may provide competitive advantage to Kp13. In contrast, the third T6SS locus found in RGP8 harbors the hcp gene (KP04341) whose product, Hcp, is also part of the needle structure along with VgrG . It has been shown that Hcp inhibited phagocytosis by macrophages in Aeromonas hydrophila, thus acting as an effector in modulating the host’s innate immune response [22, 23]. A noteworthy plasticity region detected in the Kp13 chromosome was located in RGP5 (Figure 2), which has been previously established in other bacteria as being an ICE (Integrative and Conjugative Element) . The integration of this region into the Kp13 chromosome could have been facilitated by tRNAs (for asparagine) located at its flanking termini as has been shown for other K. pneumoniae. Genes usually involved in plasmidial mobilization (mobC, KP04798 and mobB, KP04799) as well as in T4SS (KP04803-KP04813) are also present and could have aided in the mobilization of this region (Figure 2). A great part of the gene composition of RGP5 is related to that of Yersinia pestis high-pathogenicity island (HPI) which is present in many Enterobacteriaceae genera . The presence of genes coding for the yersiniabactin siderophores (irp1, KP04825 and irp2, KP04826) are characteristic of this HPI, and their occurrence in more virulent K. pneumoniae strains has been previously reported . The presence of this region is indicative that Kp13 is well adapted as a pathogen, since iron scavenging is important during infection, as this nutrient is poorly available in the host in its free form. Alternative siderophore systems were also found in the Kp13 genome and will be further detailed. The ICE region is absent in the clinical strain MGH 78578 as well as in the N2-fixing strain 342 that harbors in this region a different 115 kbp insertion containing genes related to its symbiotic lifestyle. Compared to NTUH-K2044 each strain carries unique segments within this RGP: in Kp13, this unique region is 12 kbp-long and contains several uncharacterized genes (KP04788-KP04791) (Figure 2). Since this ICE is usually found in more virulent strains, the search for this region in other Enterobacteriaceae strains isolated in Brazil may help to estimate its frequency and importance in clinically relevant bacteria. RGP7 represents an insertion found only in the chromosomes of Kp13 and MGH 78578 and contains CDSs with conserved domains at their predicted protein sequence such as glycosyltransferase (KP05060), acyltransferase (KP05301), two-component histidine kinase sensor (KP05061, KP05062) and peptidase (KP05059). The presence of kexD (KP05076) in this RGP called for special attention, since this gene codes for the recently characterized multidrug efflux pump KexD, an inner membrane protein belonging to the RND family . It was found to be overexpressed in a number of multidrug-resistant K. pneumoniae isolates, and confered resistance to erythromycin, tetracycline, ethidium bromide and other drugs . RGP12 contains Kp13-specific fimbriae and adhesins genes (KP02150-KP02154) and this insertion occurs after a tRNA gene for threonine. The aco operon (acoKABCD, KP32150; KP02898-KP02901) involved in acetoin catabolism  was also found in this region. It was detected in all compared strains, except for MGH 78578. Genomic context of RGP5 ( Yersinia high-pathogenicity island) detected in Kp13. Arrows represent predicted genes and their respective transcription strands (forward/reverse). In yellow, those that code for T4SS proteins; in blue, genes unique to Kp13; in green, genes related to siderophore production and export. The central segment unique to NTUH-K2044 contains the iro cluster related to iron capture. In orange and brown are shown, respectively, integrases and transposases. Plots above each region indicates the corresponding G + C content (%). The vertical blue and red segments connecting regions represent, respectively, direct or inverted conserved segments (BLASTN ≥ 70%). The large number of RGPs detected in Kp13 relative to the strains MGH 78578, NTUH-K2044 and 342 indicate a complex pattern of gain and loss of genetic material segments that occurred during the shaping of each of the compared chromosomes throughout their evolutionary history. It is thought that such events occur more frequently in pathogenic than in non-pathogenic bacteria, the genomes of the first group being regarded as more unstable and rearrangement-prone . We have analyzed the group of shared and unique genes between Kp13, MGH 78578, NTUH-K2044 and 342 to obtain insights that might explain their distinct virulence and pathogenic features. The results from this analysis are shown in Figure 3 and in Additional file 4. As expected, the majority of the coding sequences from the compared organisms are part of a conserved genomic ‘core’ comprising 4,269 CDSs (Figure 3). Of these, 98.8% are chromosomally located in Kp13. As the chromosomes are generally more stable replicons, it is not surprising that most of the conserved genes were detected in this genetic replicon. Most of the so-called ‘accessory’ genes, which are present or not in bacterial strains, were found in plasmids of the compared K. pneumoniae. In Kp13, 40% of its unique genes (region XIV in Figure 3) were encoded in plasmids. The largest part of these unique genes (693 CDSs) could not have any functional clues attributed and were annotated as ‘hypothetical’ (Additional file 4), highlighting the need for follow-up studies focusing on whether these genes are in fact expressed and their possible roles. Unique and shared gene content among the genomes of K. pneumoniae Kp13, NTUH-K2044, MGH 78578 and 342. The roman numbers at each partial intersection correspond to the CDSs in Additional file 4. Among the shared genes found only in clinical isolates (region III in Figure 3) we detected CDSs whose products are related to phosphonate utilization (phn cluster, KP00091 and adjacent genes in Kp13). These were previously studied in Klebsiella and may provide means to use alternative phosphorus sources such as aminoethylphosphonate, ethylphosphonate and methylphosphonate . A CDS coding for D-aminoacylase (dan, KP32221) was also detected, and shared 49% identity with the recently characterized protein from Achromobacter xylosoxidans subsp. denitrificans (BLASTP against [Swiss-Prot:P72349]). This enzyme is involved in the conversion of N-acyl-D-amino acids to D-amino acids and fatty acids . CDSs annotated as sulfatases were also found only in the clinical K. pneumoniae studied (Kp13 loci KP03498, KP03499), and their products may play a role in sulphate utilization. Most of the unique genes found in Kp13 (region XIV in Figure 3) are related to MGEs such as transposases, insertion sequences and phage genes (Additional file 4). There are also CDSs whose products are involved in capsule formation (cps cluster) such as glycosyltransferases (KP03791, KP03802 and KP03803), which are unique to Kp13. The structure of this cluster was previously studied and belonged to a hitherto unreported capsular serotype . CDSs whose predicted proteins have similarity to fructosamine deglycase (KP01294, 40% BLASTP identity to Bacillus subtilis [Swiss-Prot:O32157]) and fructosamine kinase (KP01295, 43% identity to [Swiss-Prot:O32153]) were also unique to Kp13. These enzymes are usually involved in the utilization of Amadori products, and fructosamine itself is produced via the condensation of glucose with amine compounds . We formulated the hypothesis that, if indeed the products of these CDSs play a role in fructosamine metabolism as energy source, they could provide the Kp13 isolate with an adaptive advantage in the nosocomial setting, since Amadori products are intimately related to advanced glycation end-products (AGEs). In turn, AGEs are produced as result of poorly controlled chronic diseases such as diabetes , and from this perspective these compounds could enter the bacterial cell through an adjacent transporter coded in CDS KP01297 and be converted into glucose by the aforecited enzymes, providing Kp13 with an alternative energy source within the compromised host. In fact, Kp13 was recovered from a blood culture of a diabetic patient. However, additional studies, using animal models, are required to establish the occurrence of increased frequency and/or exacerbation of Kp13-infection in hyperglycemia. Another set of unique genes found in Kp13 included the cassettes sat (KP32246, located in plasmid pKP13d), coding for streptothricin acetyltransferase involved in the resistance to streptothricin antibiotics in the context of a class 2 integron, and a CDS whose product may be related to dihydrofolate reductase activity (KP31590, located in plasmid pKP13f within a class 1 integron), which may confer resistance to trimethoprim. The latter will be further discussed in the context of blaCTX-M-2. Iron scavenging is important within the mammalian host environment since its free form is usually found at very low concentrations under physiological conditions . Iron-acquisition systems were previously studied in other strains including NTUH-K2044 and have been associated with increased virulence [33, 34]. The list of siderophore systems found in Kp13 is presented in Additional file 5. We have identified genes coding for proteins responsible for the conversion of chorismic acid into enterobactin (entABEC cluster, KP03396 and adjacent CDSs) as well as for the transport of this siderophore, which is ubiquitously found among enterobacteria (fep cluster, KP31892 and adjacent CDSs). The FhuABCD system was also found in Kp13 (coded by CDSs KP01825-KP01828) and is involved in the uptake of ferrichrome, a fungal siderophore . We have also found the genetic apparatus needed for yersiniabactin synthesis, which was previously discussed on the context of the plasticity region RGP5. Another siderophore receptor homolog (the product of CDS KP04902) displaying 70% identity to the aerobactin receptor IutA (BLASTP against [SwissProt:P14542]) was found, and could also represent a way for Kp13 to incorporate exogenous chelating compounds since the iucABCD cluster was not present in this strain, although it was found in the plasmid of NTUH-K2044 (coded in CDS pK2044_01340 and adjacencies). Other siderophore-independent iron uptake systems in Kp13 include the hmuRSTUV cluster (KP02540-KP02544), which probably code for an ABC family heme transporter; the feo (ferrous iron transport) cluster, which synthesizes three proteins (KP31748, KP00683, KP00684) involved in Fe2+ capture; and the sitABCD system, also from the ABC family of proteins involved in the transport of divalent cation such as Mn2+ and Fe2+; found in CDSs KP02550-KP02553, respectively. The diverse repertoire of iron uptake system detected in Kp13 likely influence its ability to cause infection and survive within the human host. The expression of adhesins is important during the colonization stage when diverse mechanical forces such as peristalsis and salivary secretion all act to hamper bacterial invasion within the host . The list of adhesins detected in K. pneumoniae Kp13 and related bacteria is found in Additional file 6. Most of the genes coding for these proteins were found in all K. pneumoniae strains compared, except for a fimbrial cluster present in a previously discussed plasticity region (RGP12). Type 1 fimbriae coding genes were detected in Kp13, including the fim cluster (KP02223 and adjacent genes). Their products were previously reported as enhancing virulence during urinary tract infection caused by K. pneumoniae. The mrk cluster composed by five genes (mrkABCDF, Additional file 6) that code for type 3 fimbriae is also present in Kp13. In K. pneumoniae, type 3 fimbriae have been identified as accessories mediating the formation of biofilms on biotic and abiotic surfaces such as catheters in the hospital environment . Apart from type 1 (fim) and type 3 (mrk) fimbrial adhesins, we also identified in Kp13 six other clusters related to the expression of these virulence factors which were previously studied in strain NTUH-K2044 : kpa (KP00426-KP00430), kpb (KP00500-KP00503), kpd (KP03577-KP03580), kpe (KP05219-KP05222), kpf (KP02456-KP02459) and kpg (KP02460; KP05178; KP04093). As has been previously observed , strain 342 lacks the kpf cluster which was found in the clinical isolates and is composed by genes coding for a fimbrial subunit (KP02456), a chaperone (KP02457), an usher protein (KP02458) and an adhesin (KP02459). Since strain 342 occupies a distinct ecological niche, further studies are warranted to determine the implications of kpf expression to the pathogenesis of clinical K. pneumoniae. The identification of different adhesin clusters, including one previously unreported, should be important for the control of Kp13 and related pathogenic bacteria, as these proteins have been already proposed as good vaccine candidates . The resistance determinant blaSHV gene, which codes a narrow-spectrum class A beta-lactamase known to confer the intrinsic resistance to amoxicillin, ampicillin, ticarcillin and carbenicillin, was identified in Kp13 . Indeed, both K. pneumoniae MGH 78578 and NTUH-K2044 genomes contain a blaSHV-11 copy, encoding the narrow-spectrum SHV variant. Kp13 showed two copies of blaSHV genes: blaSHV-12 (found in the plasmid pKP13f) encoding an extended-spectrum beta-lactamase (ESBL); and a chromosomally-encoded blaSHV-110 gene coding for an enzyme whose spectrum of activity has not been characterized yet (Table 3). The blaSHV-12 copy was located downstream an IS26 element (KP05944), while blaSHV-110 was found downstream the lac operon and was followed by an uncharacterized HTH-type transcriptional regulator CDS (KP01127). *,BLASTP against the NCBI database; Chr, chromosome; nd, not determined; pKP13[d/f], plasmid pKP13d/pKP13f. Several acquired beta-lactamase-encoding genes were identified in plasmids pKP13f and pKP13d of Kp13, namely blaTEM-1, blaOXA-9, blaCTX-M-2, and blaKPC-2 (Table 3), genes that if properly expressed are enough to confer resistance to all beta-lactam agents. blaTEM-1 encodes a class-A beta-lactamase with limited spectrum of activity, that confers resistance against penicillins and first-generation cephalosporins and whose activity is inhibited by clavulanic acid . The blaOXA-9 gene probably encodes a class-D beta-lactamase with narrow spectrum of activity, although its complete biochemical characterization remains to be determined. OXA-9 is inhibited by clavulanic acid and cloxacillin, but differently from most OXA enzymes is not inhibited by NaCl, conferring a phenotype typical of class A enzymes production . The blaCTX-M-2 gene encodes an ESBL commonly observed in Enterobacteriaceae isolates from humans, swine and poultry manure, although this gene has also been identified in P. aeruginosa, Vibrio cholerae and Acinetobacter baumannii clinical isolates . In Kp13, blaCTX-M-2 is found downstream a class 1 integrase CDS (KP03119) and adjacent to the Orf513-coding gene (KP03126), also named ISCR1, which possibly mediates the dissemination of this gene . As previously described , this integron contains a duplication of its 3′ segment where truncated qacE (between CDSs KP18328 and KP03130) and sul1 (KP03130 and KP03134) were found. The overall architecture of the blaCTX-M-2 region in Kp13 is closer to that described for the class 1 integron harboring blaCTX-M-59 (termed In0506) recovered from patients in São Paulo, Brazil , with which the Kp13 sequence shares 99% identity (BLASTN against GenBank accession no. EU622856), and the difference relies on the non-synonymous change in blaCTX-M-2. This region also carries resistance determinants to other antimicrobial classes, including the genes dfrXVb (KP31590), encoding an alternative dihydrofolate reductase that is associated with resistance to trimethoprim and a cmlA- like (KP18323), which codes for an efflux pump related to chloramphenicol resistance . Of special interest in Kp13 was the detection of blaKPC-2 (KP06703, found in pKP13d) gene coding for the K. pneumoniae class A carbapenemase (KPC-2). The expression of KPC-2, especially when associated with porin alterations, can give rise to resistance against all beta-lactams. The genetic context of blaKPC-2 includes an upstream insertion sequence (ISKpn6, KP06702), as well as a resolvase CDS (Figure 4). It is of notice that no inverted repeats related to Tn4401 were detected, since this transposon is frequently associated with the mobilization of the carbapenemase gene . The absence of such signals can be regarded as evidence that the spread of blaKPC-2 also occurs solely by recombination events involving ISKpn6 and the flanking Tn3-family sequences. Genetic context of bla KPC-2 in K. pneumoniae Kp13. Genes are depicted as horizontal arrows (orientations indicate their transcriptional direction). Some structures of this region are highlighted, such as an inverted repeat right (IRR) of the Tn3 transposon, as well as inverted repeats flanking ISKpn6 (depicted as black triangles). Also shown are the localization of two rho-independent transcriptional terminators (T1, T2) identified using the ARNold webserver  and their corresponding sequences. Mutations in specific sites in genes coding for proteins used as targets for antimicrobials, such as GyrA and ParC, can result in decreased drug sensitivity. Kp13 showed the double substitutions Ser83 → Phe and Asp87 → Asn in GyrA (KP00955) which are known to confer ciprofloxacin resistance . Also, a single amino acid change, Ser80 → Ile, was detected in ParC (KP02784), and the combined effect of these mutations could have contributed to the high-level resistance to quinolones displayed by Kp13 as has been shown for other pathogenic bacteria . MGH 78578 carries the Ser83 → Tyr mutation in GyrA, while in NTUH-K2044 no mutations in this gene were detected. No changes in the ParC quinolone resistance-determining region were detected in these strains. Another well recognized resistance mechanism by target alteration is the expression of 16S rRNA methyltransferases. These enzymes transfer methyl radicals to certain nitrogenous bases located at the A site of 16S rRNA in the 30S portion of the ribosome and confers resistance to most clinically-relevant aminoglycosides . Kp13 harbored the rmtG gene (KP01427) in plasmid pKP13f, which encodes a 16S rRNA methyltransferase recently described from a K. pneumoniae clinical isolate from Brazil . Immediately upstream this gene a putative tRNA ribosyltransferase CDS (KP01428) was found. A CDS annotated as a transposase (KP01425) is located close to the 3′-end of rmtG, and search against the ISFinder database classified this sequence in the IS91 family, although it is unclear whether this transposon is involved in the mobilization of rmtG. We searched the genome of Kp13 and related K. pneumoniae for known MDR efflux pumps. Table 4 summarizes these results, which include pumps belonging to the five main families of efflux proteins. The tolC gene coding for accessory protein TolC used by many systems is found in CDS KP02796 in Kp13. ∆, in the case where the pump is encoded by multiple CDSs, the ID corresponds to one of the adjacent CDSs. Ω, based in the literature found for each system. Substrate nomenclature adapted from : AC, acriflavine; AG, aminoglycosides; BI, bicyclomycin; BL, beta-lactams; BS, bile salts; BENZ, benzalkonium chloride; CCC, carbonyl cyanide chlorophenylhydrazone; CM, chloramphenicol; CV, crystal violet; DC, deoxycholate; EB, ethidium bromide; EM, erythromycin; ENX, enoxacin; FA, fatty acids; FQ, fluoroquinolones; FOM, fosfomycin; FM, fosmidomycin; FU, fusidic acid; ML, macrolides; NA, nalidixic acid; NFX, norfloxacin; NO, novobiocin; OS, organic solvents; RD, rhodamine; RF, rifampicin; SDS, sodium dodecyl sulfate; STZ, sulfathiazole; TC, tetracycline; TCS, tetrachlorosalicylanilide; TLM, thiolactomycin; TPP, tetraphenylphosphonium chloride; TX, Triton X-100; ?, regarded as related to multidrug-resistance, but with an unknown resistance spectrum. *, evaluated by BLASTP against the target genome. One of the main efflux-related resistance mechanisms involves the expression of the acrAB genes, coding for a periplasmic protein (AcrA, KP03629) and a transporter protein (AcrB, KP03630) which use the aforecited TolC channel. Expression of these genes is regulated by the adjacent acrR gene (KP03628), as well as by marR, ramR and soxR genes; mutations in these genes may result in acrAB overexpression, thus contributing to the MDR phenotype . However, we did not detect alterations in these genes, suggesting that other efflux systems in Kp13 might be involved in the extrusion of antimicrobials (Table 4). Another well-studied efflux pump identified in Kp13 and other compared K. pneumoniae strains is OqxAB (coded in CDSs KP02440/KP02441), which was first identified in E. coli plasmids. It has been widely reported in K. pneumoniae clinical isolates, where it is usually chromosomally located . The expression of oqxAB has been associated with resistance to quinolones , and it remains to be investigated whether this system contributes to the high-level fluoroquinolones resistance displayed by Kp13. Other efflux systems found in the compared K. pneumoniae include homologs of AcrD (RND family), MdfA and MdtH (both from the MF superfamily) (Table 4), involved in the efflux of aminoglycosides and fluoroquinolones , compounds to which Kp13 displays resistance. The majority of the efflux pumps are conserved among the different strains and most of them can recognise more than one substrate (Table 4). Despite this qualitative conservation, we have identified several non-synonymous mutations in various genes coding efflux pumps in the Kp13 genome when compared with NTUH-K2044 and MGH 78578 (see SNPs analysis section and the table in Additional file 7), although whether these alterations change the specificity profile of these systems remains an open question. We studied the common porins present in K. pneumoniae bacteria, namely OmpK35 (homolog to OmpF in E. coli) and OmpK36 (the OmpC homolog). In strain Kp13, the genes coding for these proteins are found in CDSs KP04180 and KP00950, respectively. While we observed an overall conservation at the gene sequence level between Kp13 and the compared strains for both ompK35/ompK36, a peculiarity in the chromosome of Kp13 in the region upstream ompK35 was detected with the insertion of an IS1380 family transposase (KP04179), which does not occur in the compared K. pneumoniae strains. Multiple alignment of this region and in silico promoter search suggested that this recombination event disrupted the probable promoters needed for ompK35 expression (see Additional file 8 [A]). Experimental evidence corroborating this hypothesis was obtained by the extraction and analysis of outer membrane (OM) proteins using SDS-PAGE , where OmpK35 was not visualized (Additional file 8 [B]). Porin loss was previously studied in K. pneumoniae and the non-expression of ompK35 was associated with increased resistance to antibiotics such as cephalosporins and cephamycins . Thus, loss of OmpK35 appears to be another mechanism employed by strain Kp13 that contributed to its MDR profile. Polymyxin B is a rapid-acting bactericidal agent that interacts with the OM lipopolysaccharide (LPS) in Gram-negative bacteria. It was recently shown that the two-component systems PhoPQ and PmrAB together with the Rcs system govern polymyxin-induced transcriptional changes, and that there is a cross talk between PhoPQ and the Rcs system . In the genome of Kp13, we identified all these regulatory systems: PhoQP (in CDSs KP04870, KP04869), PmrAB (in CDSs KP03034, KP3033) and RcsBCD (in CDSs KP00953, KP00954, KP00952). Transcriptional studies are ongoing to determine the regulons networks that govern polymyxin B-induced changes in Kp13. SNPs were determined for three comparisons using the complete chromosome sequence of Kp13 as reference aligned against: i) the complete chromosome sequence of strain MGH 78578, ii) complete chromosome sequence of strain NTUH-K2044 and iii) complete chromosome sequence of strain 342. The number of SNPs falling within non-coding and coding regions (non-synonymous, synonymous and non-sense) between each comparison are listed in Figure 5A. It can be seen that strain 342 accumulated a total number of mutations much larger than the other two strains in comparison to Kp13 (data not shown). This result is in accordance with the proposed hypothesis that this strain should be reclassified as K. variicola. 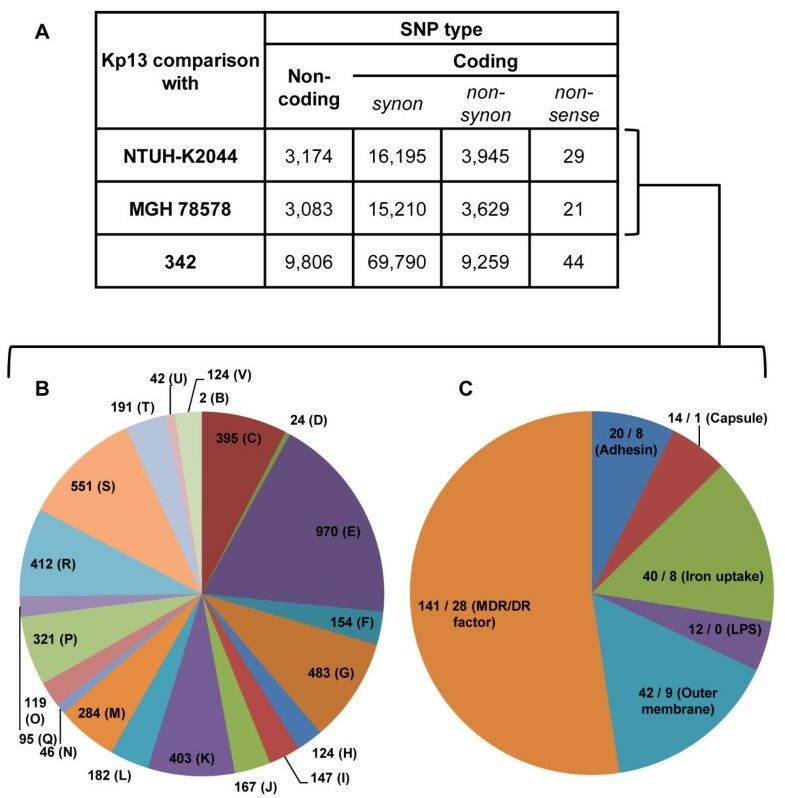 Then, we investigated the common SNPs identified in all CDSs of Kp13 (grouped according to their COG functional category) against both pathogenic strains, MGH 78578 and NTUH-K2044 (Figure 5B and Additional file 9). These SNPs represented unique Kp13 alleles relative to the latter two human pathogenic strains. Disregarding uninformative categories such as general function prediction and unknown function, the ones which accumulated more SNPs were E (amino acid transport/metabolism) and G (carbohydrate transport/metabolism). Also, 124 SNPs were identified within CDSs related to category V (defense mechanisms). Subsequently, in order to understand the significance of SNPs in relation to the Kp13 lifestyle, we investigated all SNPs falling within CDSs related to virulence and resistance. Notably, most SNPs (141 in total) were identified within CDSs involved in drug resistance (MDR/DR) (Figure 5C, Additional file 7). They are followed by CDSs whose products function as OM proteins, accounting for 42 mutations, such as the CDS for an OmpA domain-containing protein, which carries four non-synonymous mutations (out of a total of 9) (Additional file 7). However, the role of non-synonymous mutations found among CDSs involved in drug resistance in K. pneumoniae remains unknown. Single-nucleotide polymorphisms (SNPs) identified in K. pneumoniae Kp13 compared to MGH 78578, NTUH-K2044 and 342 strains. (A) Total number of SNPs falling within non-coding and coding regions (CDSs) when compared with the three other strains. synon, synonymous. (B) Common SNPs falling within CDSs grouped by COG classification identified when compared with the strains NTUH-K2044 and MGH 78578. (C) Selected common SNPs falling within virulence- and resistance-related CDSs identified when compared with the NTUH-K2044 and MGH 78578 strains. MDR/DR, multidrug resistance/drug resistance; LPS, lipopolysaccharide. Numbers after the slash indicates the number of non-synonymous SNPs. COG classes single-letter abbreviations in panel B are: B (chromatin structure), C (energy production/conversion), D (cell division/chromosome partitioning), E (amino acid transport/metabolism), F (nucleotide transport/metabolism), G (carbohydrate transport/metabolism), H (coenzyme transport/metabolism), I (lipid transport/metabolism), J (translation/ribosomal structure), K (transcription), L (replication/recombination/repair), M (cell wall/membrane/envelope biogenesis), N (cell motility), O (posttranslational modification/protein turnover/chaperones), P (inorganic ion transport/metabolism), Q (secondary metabolite biosynthesis/transport/catabolism), R (general function prediction), S (function unknown), T (signal transduction), U (intracellular trafficking/secretion), V (defense mechanisms). The SNPs analysis performed in Kp13 relative to the two other human pathogenic strains has shown that there are Kp13-specific alleles occurring in many functional COGs, suggestive that these SNPs could result in a variety of diverse phenotypic effects. Moreover, the amount of SNPs found in CDSs associated with drug resistance may give additional clues on the distinctness of Kp13 compared to MGH 78578 and NTUH-K2044. An interesting follow-up for this study would be to analyze the relationship between the amino acid sequence substitutions in these proteins and their corresponding structural alterations, which could relate to the resistance phenotype of Kp13. As an example, non-synonymous mutations in possible MDR-related genes were detected, such as in mdtB (respective changes at the protein level Ile93 → Met, Ala352 → Thr, Arg526 → His, considering the Kp13 CDS KP04638 as reference) and an acrB homolog (Thr511 → Ala, Val542 → Ala) (Additional file 7). Finally, the results from the SNPs analysis shed light on the plasticity of the Kp13 genome at the nucleotide level, which complement the observed plasticity at the broader level of genomic segments, discussed within the context of RGPs. We have thoroughly mined the genome of K. pneumoniae strain Kp13, which to our best knowledge is the first completely determined and closed genome of a K. pneumoniae representative involved in a large hospital outbreak. The Kp13 genome is composed by one chromosome and six plasmids of variable sizes. They harbor multiple resistance and virulence loci, coding a diverse range of siderophores, efflux pumps, beta-lactamases and adhesins that might contribute to the succesfull adaptation of this strain to the hospital environment. We also identified alterations in the porin profile of Kp13, which were confirmed experimentally. Multiple regions of genomic plasticity were detected in this strain including the yersiniabactin high pathogenicity island and T6SS-related loci, which could be propagating through HGT to related bacteria. Although the compared genomes present an overall conserved architecture, we have demonstrated the singular characteristics of Kp13 that differentiates this strain from previously studied K. pneumoniae and may have contributed to its fitness and succesfull spread on the hospital environment. Within the context of chromossomal architecture and RGPs analyses, we might also assume that the major force that models the genomes of the compared K. pneumoniae strains is HGT instead of genomic rearrangements. Moreover, the genome plasticity of isolate Kp13 was corroborated at multiple levels of analysis, from the broader, whole genome structure context, to the finer level of single-nucleotide polymorphisms. The Ethics Committee of the Universidade Estadual de Londrina (UEL) approved the present study under reference number CAAE:3356.0.000.268-09. Clinical evaluation and blood sampling were performed after diagnostic routine procedures in the intensive care unit of the Hospital Universitário (UEL) with written informed consent of the patient. Klebsiella pneumoniae isolate Kp13 was obtained from the blood culture of a patient admitted to the intensive care unit with diabetes mellitus and cranial encephalic trauma . This bacterium was isolated during an event of nosocomial outbreak due to KPC-2-producing K. pneumoniae that occurred at the Hospital Universitário (UEL) between February and May 2009. The antimicrobial susceptibility profile of Kp13 was confirmed by broth microdilution. Antimicrobials tested included ampicillin, amoxicillin/clavulanic acid, piperacillin/tazobactam, cefoxitin, ceftriaxone, ceftazidime, cefepime, imipenem, meropenem, ertapenem, gentamicin, amikacin, levofloxacin, polymyxin B and minocycline, and tigecycline. MICs were determined and interpreted following the CLSI guidelines for Enterobacteriaceae[63, 64] except for tigecycline and polymyxin B where FDA  and EUCAST  breakpoints were applied, respectively. Kp13 was susceptible to tigecycline (MIC, 0.25 mg/L) and minocycline (MIC, 2 mg/L), and displayed resistance to ampicillin (MIC, >32 mg/L); amoxicillin/clavulanic acid (MIC, >32/16 mg/L), piperacillin/tazobactam (MIC, >128/4 mg/L), cefoxitin (MIC, >32 mg/L), ceftriaxone (MIC, >64 mg/L), ceftazidime (MIC, >32 mg/L), cefepime (MIC, >32 mg/L), ertapenem (MIC, ≥1024 mg/L), imipenem (MIC, 64 mg/L); meropenem (MIC, 64 mg/L), amicacin (MIC, >64 mg/L), gentamicin (MIC, 256 mg/L) and polymyxin B (32 mg/L). In addition, this isolate showed the carbapenemase producer phenotype and was confirmed to carry the gene encoding KPC-2 . Both shotgun and 3 kb paired-end library were constructed and the genome sequencing of K. pneumoniae isolate Kp13 was carried out using the Genome FLX sequencer (454 Life Sciences/Roche), as previously described . Genome assembly was performed using Newbler v 2.6 (Roche) and Celera genome assembly v 6.1 (JCV Institute). Gaps within scaffolds resulting from repetitive sequences were resolved by in silico gap filling. We achieved mean sequence coverage of 111× for this genome. The SABIA pipeline  was used for gene prediction and automatic annotation followed by manual validation of each predicted CDS. Multilocus sequence typing was performed as previously described . Briefly, the trimmed nucleotide sequences of seven housekeeping genes namely rpoB, gapA, mdh, pgi, phoE, infB and tonB were analyzed using the Klebsiella pneumoniae MLST Database, available at http://www.pasteur.fr/recherche/genopole/PF8/mlst/Kpneumoniae.html. For each allele was given a number that combined yielded the sequence type (ST). The goeBURST algorithm was employed to generate a minimum spanning tree using the information of isolates available and the PHYLOViZ tool . Clonal complexes included STs sharing at least 5 identical alleles between their representatives. The MicroScope platform [70, 71] provided some of the tools used for the comparative genomic analyses, such as the RGPFinder and Phyloprofile modules for determination of regions of genomic plasticity (RGPs) and unique/shared gene content identification, respectively. RGPs are defined as DNA segments over 5 kbp possibly related to events of horizontal exchanges, and they are identified using a series of constraints such as G + C% deviation, compositional biases as measured by the tools Alien_Hunter  and SIGI-HMM , synteny breaks and proximity to tRNAs. 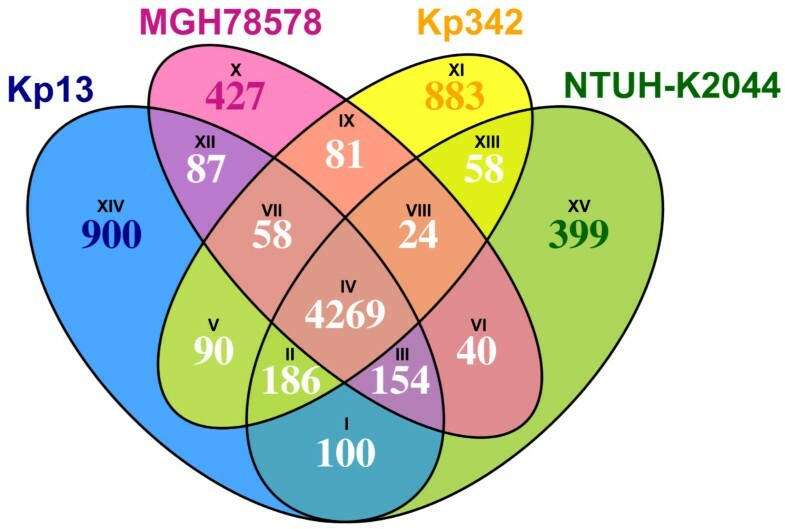 In these analyses, the Kp13 chromosome was set as the reference and RGPs were searched relative to those of strains 342, MGH 78578 and NTUH-K2044. Each identified RGP was manually inspected based on its genomic context and conserved genes located at the flanks of the region. Elements characteristic of horizontal transference events such as tRNAs, transposases and prophage sequences were also searched for within each region. EasyFig  was used to generate comparative figures of specific regions, while the BLAST Ring Image Generator 0.95  was used to plot the chromosome map as well as arrange and visualize the RGPs within the overall Kp13 chromosome context. In order to identify unique and shared gene content, the PhyloProfile Exploration tool within MaGe was used, and the following criteria from Jenssen et al. were adopted to define orthology between two translated open reading frames: (i) the smaller protein covering at least 80% the length of the larger (minLrap ≥ 0.8); (ii) protein identity ≥ 35%. A Venn diagram of the unique/shared gene content was generated with a custom R script using the package VennDiagram . Chromosomal architecture comparison between K. pneumoniae strains were carried out using the progressiveMauve algorithm implemented in Mauve 2.3.1  at its default parameters. For this analysis, sequences from the chromosome of strains 342 [GenBank:CP000964], MGH 78578 [GenBank:CP000647] and NTUH-K2044 [GenBank:AP006725] were downloaded from the NCBI website and used as input to Mauve. Phage-related sequences were searched using PHAST , while T4SS-related sequences were scanned for using the AtlasT4SS database . The investigation of the resistance and virulence repertoire was facilitated by BLASTX sequence comparison to the Antibiotic Resistance Genes Database , as well as throughout the manual annotation of the Kp13 genome, when CDSs related to these functions were flagged. Insertion sequences were characterized using the ISFinder database (http://www-is.biotoul.fr/) . SNP analysis was carried out as previously described . Firstly, three primary SNP-call sets were generated from comparisons between Kp13 and the strains MGH 78578, NTUH-K2044 and 342. Then, scripts in PERL were written to function as quality filters to acquire the most reliable SNP-call sets for the comparisons. Alignments were made using the NUCmer algorithm from the MUMmer v.3.0 package . SNPs were also classified regarding their location on intergenic region or CDS (with its corresponding annotated function and related COG category) . The NCBI BioProject accession of K. pneumoniae Kp13 is PRJNA78291. The sequences reported here have been deposited in the GenBank database (http://www.ncbi.nlm.nih.gov/Genbank) under accession number [GenBank: CP003999] for the chromosome. The six plasmids are available under accession numbers [GenBank:CP003996] (pKP13a), [GenBank: CP003994] (pKP13b), [GenBank: CP003995], (pKP13c), [GenBank: CP003997] (pKP13d), [GenBank: CP003998] (pKP13e) and [GenBank: CP004000] (pKP13f). We thank Alex Sandro Mundstein and Oberdan de Lima Cunha for carrying out the automatic genome annotation at the SABIA platform, as well as Rangel Celso Souza for preparing the GenBank flat files for submission. PIPR had a Masters scholarship from Coordenação de Aperfeiçoamento de Pessoal de Nível Superior (CAPES), Brazil, and is currently a recipient of a PhD scholarship from this agency. ACG would like to thank the Conselho Nacional de Desenvolvimento Científico e Tecnológico (CNPq), Brazil (Process number: 307816/2009-5). MFN thanks the CNPq, Brazil (Process number: 309370/2009-4) and the Fundação Carlos Chagas Filho de Amparo à Pesquisa do Estado do Rio de Janeiro (FAPERJ), Brazil (Process number: E-26/102.214/2009). ECV and MP provided the Kp13 isolate and performed bacterial identification. ATRV and MFN conceived the pyrosequencing strategy. Manual annotation and bioinformatic analyses were performed by ACG, ACPV, CM, DEX, FGB, LGPA, MFN, NCBL, PIPR, RCP and RG. SNPs analysis was performed by NCBL and MFN. The maintenance and update of KlebsiellaScope in the MicroScope platform was performed by CM and her team. The manuscript was prepared by PIPR, MFN, RCP and ACG. All authors read and approved the final manuscript.